Fright Nights at Playland return on select nights October 5-31, 2018, featuring 20 blood-chilling rides, gripping live shows, 8 haunted houses and much more. Bloodshed, the newest haunted house introduced in 2017, is set to welcome only the bravest of souls. The dilapidated Bloodshed cabin is home to a family of ruthless mutant murders. For those seeking a paranormal experience, the Haunted Mansion promises thrills and chills not for the faint-of-heart, while the 3D experience of Car-n-Evil will leave guests with all the requisite symptoms of panic, terror and dread. Not enough for you? Visit the Keepers Doll Factory, which features a creepy line-up of cloaked giants covered in scars, porcelain doll faces and missing appendages. Watch out, because they roam the halls in search of human sacrifices from which they can harvest limbs. 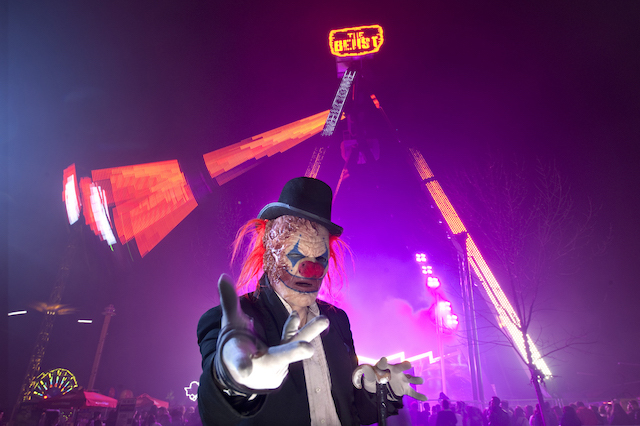 In addition to the houses, these Playland rides are guaranteed to provide a terrifying experience: The Beast, the Wooden Roller Coaster, the Hellevator and AtmosFEAR, as well as a selection of other hair-raising rides. In search of a classic freak show to shake your belief in common sense? Guinness World Record holders and returning favourites, the stapled, sliced, slapped and smashed Monsters of Schlock will return from October 11th to 31st to perform some of the most incredible and outrageous physical stunts ever seen. Guests at Fright Nights have the option to purchase a Rapid Pass, which offers the same access as a regular gate pass PLUS access to an expedited line for park entry, each haunted house and The Beast, Wooden Roller Coaster, Music Express, AtmosFEAR, and Hellevator. Guests will also be able to save $3 by purchasing tickets at participating 7-Eleven locations or online. Due to the overwhelming demand and to ensure a quality guest experience, Fright Nights is putting a cap on the number of tickets sold per day. Tickets must be purchased for a specific date. Event nights have limited availability and may sell out. Admission includes unlimited access to all 8 haunted houses, shows and 20 rides. There is an additional charge for the Revelation. I will draw one winner at random from all entries at 12:00pm on Monday, October 8, 2018. The winner will get to choose their date, based on availability. Follow Playland on Twitter and Facebook for more information about Fright Nights. Warning! Not recommended for ages 12 and under, seniors 65+, people with sensitivity to strobe lighting or fog machines, people with high blood pressure, heart conditions, pregnant women or scaredy-cats. Absolutely no guest costumes or guest costume face make up allowed. Update The winner is: Lori! It’s been forever since I’ve been to Fright Night. I remember having a blast. Would love to go again. Yes! I would love this one! I’ve never been and would love to go!! Would love to take my son! Would be a fun first time to go! I would go with my kids, would be so much fun. I would love to win and send son and his friend! kids coming up this weekend. How fun for them to go. I would love the chance to go to Fright Nights!! Never been..looks spooooctacular!! Yes please! Hubby has wanted to go for years!!! It’s been 13 years – gulp! – since I’ve gone to Fright Nights. My sons want to go and would love to win tix for them. Such an amazing prize!! Love your blog! Love your blog! Fright Nights is a great Halloween attraction! Would love to check it out!!! Sounds like so much fun. I’d love to go! I would love to win this for my daughter and her friends. I am so excited for the haunted houses this year! Is Pennywise there? Gives me the chills thinking about it. Spooky stuff, I wanna win!! Would love to go; have never been to one. Would love to go to Fright Nights again!!! I’d love to go. Never been! My daughter and her friends would love these! In need of something exciting! Heard that it’s another very fun AND scary event…would love to check out Dollhouse and have my hair stand on end! SOUNDS LIKE IT’LL BE A HOWLING GOOD TIME! I would to go!! Thanks for this chance Miss604!! I would love to go!!!!!!! !